In the circle of growers I talk to, hay conditioning has often become a topic of conversation and how well some of the newer conditioning equipment works. There are a small number of growers in WNY who own conditioners that are used a few hours after hay is cut and before tedding takes place to speed up dry down. But, you often hear mixed stories on how well these units work. There has been very little research done on dry down times and the effects on hay quality. Because of these uncertainties, adding an additional trip across the field, and the cost of these units, farmers are hesitant to pursue purchasing. I know several growers and I'll include myself in this group that purchased a 1950's vintage hay crusher/crimper with the thought that this is the same principal. But, I have not been impressed with the results. This summer I am performing trials with 2 different types of new conditioners, the hay Accelerator and Macerator. There are some growers in WNY that own an Accelerator or a very similar unit called the Recon. These machines have metal rollers that interlock, crushing and crimping the stems as the hay passes through. These units are in the price range of $18,000 to $25,000 depending on the manufacturer and options. The Macerator is more expensive, selling for around $32,000. I don't know of any farmers around the area that own a Macerator. The Macerator uses 2 sets of rollers. The first set is rubber and squeezes the hay, while the second set is metal and spins faster while nicking the stems. I obtained the 2 units in the beginning of June but had little luck with conducting trials because of the consistent rain fall. Cummins and Bricker ended up selling the Accelerator unit that was being demoed, so I have very little data from that machine in first cutting. But, they have supplied us with another unit for second cutting. As for the Macerator unit we did witness some significant increases in dry down time and the hay is much softer in the bale although some leaf loss is noticed in late cut first cutting. So how well do they work? Between rains we started to cut hay at noon and macerated right after the field was cut while it was still sprinkling on a cloudy, windy day. The hay was tedded 3 hours later and again the next morning. The hay was raked at 2 p.m. and baled at 4 p.m. o"clock. It had been just 28 hours and the hay was baled at 10% to 12% moisture. The windrows that were left to just be tedded were 22% to 24% moisture. I have always found it is the hardest to get the hay to drop from 20% to 14% moisture. It worked well on this occasion and I'm looking forward to conducting the side by side with Accelerator in the second cutting. Forage quality is also being tested to compare extra conditioned to conventional mower conditioned hay to verify effects of the leaf loss on quality. Over the next few weeks a series of side by side trials will be performed on second cutting hay. We will be hosting a field demonstration and displaying results at 9:00 a.m. on August 20th, at David Stephen's farm on Prole Road (the road east of Empire Tractor) between Route 5 & 33 in the town of Batavia. Equipment reps will be at the event to assist with any questions. 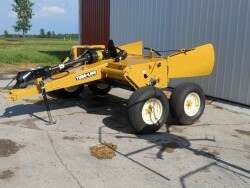 John Hanchar will also provide a financial summary of number of acres/bales for the cost effectiveness of each machine.